Mundo Lindo ~ Beautiful World. 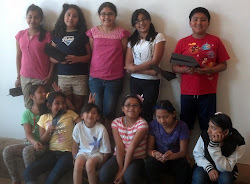 Where kids discover the joy and power of creativity… This blog chronicles a free after-school program for 4th & 5th grade kids in Escondido, California. May 9, 2013 was the last day of Mundo Lindo. We decorated picture frames with mosaic tiles (sort of like my friend and mosaic artist Jill G. Hall), beads and paintbrushes. Thought you all might be interested in the history of Mundo Lindo. Mundo Lindo means Beautiful World in Spanish. I created the program in 2007, and received a grant from the Kenneth A. Picerne Foundation. 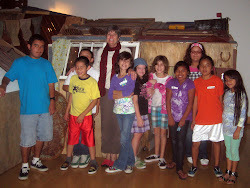 The grant required I partner with a non-profit and I approached Katie Ragazzi and Escondido Children’s Museum. For the two years Mundo Lindo was funded by Picerne, I taught it year round, two days a week, for two hours each session in the Children’s Museum. (After the first year, the Picerne Foundation rented a studio at California Center for the Arts, Escondido for the program.) Picerne also paid for an assistant for me. The Children’s museum helped with registration and used their contacts in the Escondido Public Schools to contact 4th and 5th grade kids. The program has always been free to the children. The Picerne grant paid me $12,000 a year, and $2,000 for materials for the lessons. When the grant ended, in 2009, Tomoko Kuta, CCAE director of Education (at the time), approached me to continue Mundo Lindo, starting in 2010. She had witnessed the success of the program over two years and was impressed by how engaged the children were in each activity. 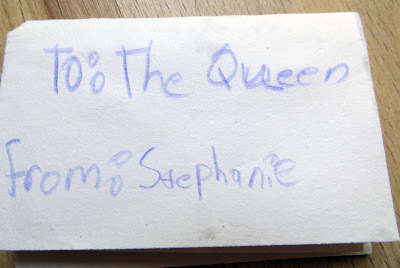 She hired me on an hourly basis (no contract) and and for the last 4 years, I was paid only when I was at the Center teaching (about 2-1/2 hours a week). CCAE provided me with an assistant. Materials were infrequently purchased as needed. And since 2009, has run only during the school year (no summer classes). And since ~ 2011, the program has run one day a week, during the school year. Children register for the classes and return week after week after week, many continuing for 2-3 years. 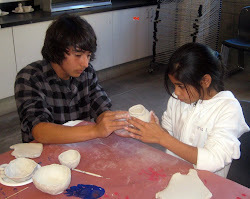 Mundo Lindo provides art instruction and an outlet for creative expression for the kids. I create and teach a different project and use a different medium each week. The children have two hours to work with their hands, have fun, work as a team, and get to know kids from the other schools in Escondido. As of now, May 2013, Mundo Lindo will no longer be offered at CCAE. 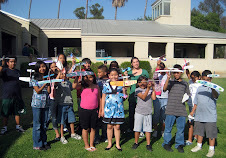 I'm hoping to find a new location and partner for the fall of 2013, to continue the program in Escondido, California. We've made egg carton flowers before, but I found these colored egg cartons and thought they'd be great for spring. I bought the small wreaths at the local craft supply store. The kids finished early and it was a beautiful day, so we went outside for airplane races. Liz gives the kids a lesson in making paper airplanes. Next Thursday, May 9th is the last day of Mundo Lindo for the school year and in this location. 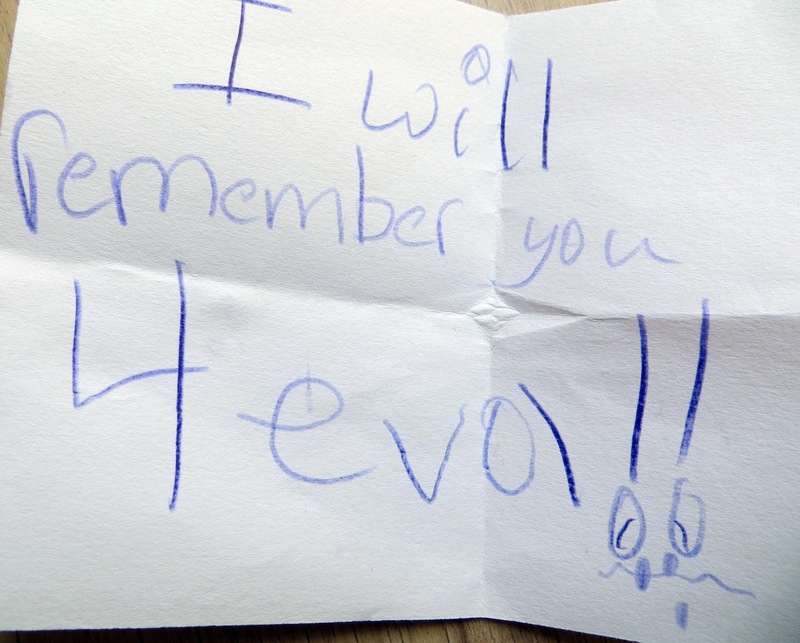 We're hoping to find a new home for the program by the time school starts again in the fall. to hang with the others. of my baggy corduroy trousers. my heart beat like a tom tom. Mundo Lindo celebrates Spring Break! It was a beautiful day. The kids are on spring break, so we just had 10 in class today. Why not spend the time in the park? Before we left the classroom, the kids made quick little sketchbooks. They brought pencils and erasers with them to sketch in the park. But first, we had to use our plastic bowls as boats in the City Hall fountain. And it was just too nice a day not to get in the fountain. Evidently, there was a sign that said 'no swimming' but we weren't swimming. The security guards thought otherwise, so we went back to the park to dry and and draw. Yohana drew a picture of one of the security guards. We all went over to show him the picture and he loved it! He asked her to sign it, and if he have it to frame back at the office. It was a very sweet moment! We finished up our wonderful spring break afternoon at the playground. Yoga Poses in Public Places! Mr. Rogers said "When we treat children's play as seriously as it deserves, we are helping them feel the joy that's to be found in the creative spirit. It's the things we play with and the people who help us play that make a great difference in our lives." 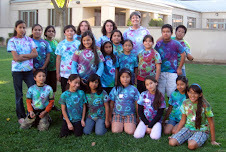 A program created and taught by Jane LaFazio begun in 2007 of free weekly 2-hour after-school art class for fourth and fifth grade children in the low-income population of Escondido [San Diego North]. The first two years of Mundo Lindo were funded by The Kenneth A. Picerne Foundation. Since 2010 Sponsored by California Center for the Arts, Escondido, CA and grants from generous people and organizations. As of May 2013, Mundo Lindo has ended. I'm hoping for a non-profit partner to continue it, in Escondido in the fall 2013. Some of the Mundo Lindo kids! 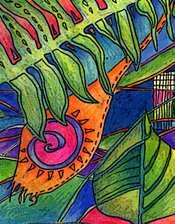 Jane LaFazio, a full-time artist since 1998, truly believes she is living the life she was meant to live! In that time, she has cultivated a wide range of skills as a painter, mixed media, quilt artist, art teacher and blogger. She’s known for her fun-loving, creative teaching style, and providing a relaxed supportive environment in the classroom. She teaches workshops online and at art retreats internationally. Jane’s artwork has been featured in Cloth, Paper, Scissors and Quilting Arts magazines many times, and in Danny Gregory’s An Illustrated Life, and in numerous books. Jane has made numerous appearances on Quilting Arts TV and is featured in instructional DVDs “From Art Journaling to Art,” “Layered & Fused Applique Quilts: From Fabric Scraps to Recycled Circles” and “The Small Art Quilt” are available on Amazon.